The UK may have banned guns, but that doesn't stop bad guys from killing. London has a knife-killing problem the way American cities have a gun-killing problem. The common denominator is not the weapon, but the man who wields it. It's a shame Harry got killed. He was a handsome young man. 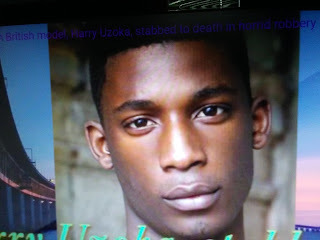 The Guardian reports a young model stabbed to death in west London has been described as a “special soul” as tributes were paid to the latest victim of knife crime in the capital. Scotland Yard said the 25-year-old man was fatally stabbed on Thursday in Shepherd’s Bush. Two men have been arrested on suspicion of murder. Police have not formally identified the victim, but he has been named on social media and in reports as Harry Uzoka, who was signed to Premier Model Management, which helped launch the careers of models such as Naomi Campbell and Claudia Schiffer.